For those of you interested in dabbling with some mixed mediums, SNR are running a series under the Mixed Media section introducing gels and pastes and what can be done with each. You'll find eye candy inspiration as well as some easy to follow technique tutorials. Our first task was to make a selection form various gel mediums and create a background using the gel medium as a glue. This is what I came up with. Heavy gel medium is exactly what its name says, a gel with a very thick consistency which, amongst many other uses, is perfect for gluing larger embellishments to your projects. For my example I selected various size, shapes and colour beads to create a really striking background. Step One: Using a marker draw a design on your ATC card to use as a guideline. Step Two: Add some heavy gel medium to a small section of your ATC. It is advisable to work in small sections at one time to minimize the mess and to make it easier to place your beads according to your design. Step Three: Begin placing your beads in the allocated areas of your design as shown above. Three easy steps to creating a gorgeous textured background. You can use this technique on other projects like tags, inchies and cards. 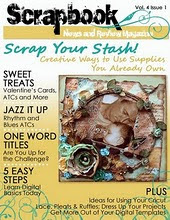 It would also look fabulous as part of a background for a scrapbooking layout. Love this idea... so pretty!